Phil suggested meeting at Dognation for lunch after reading good things about it. It is at the Little Collins end of the Causeway which runs down from Bourke Street Mall. 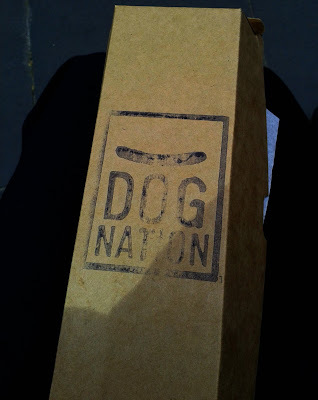 I was expecting Dognation t be small, but not literally a hole in the wall... well there was one table with three chairs, but that was occupied... 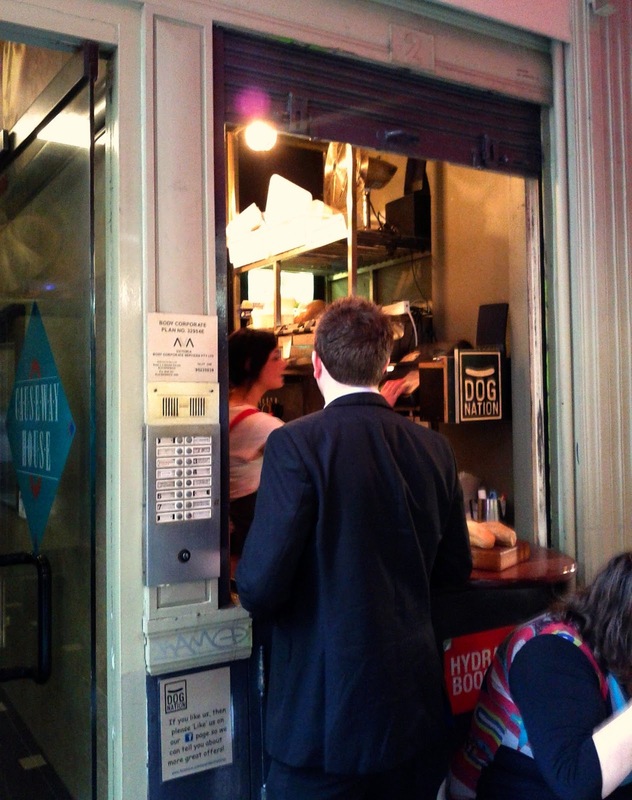 The menu offers five hot dogs from different cities, including Berlin, Tokyo and Melbourne, with appropriate ingredients and flavours, and a choice of multigrain or white rolls. 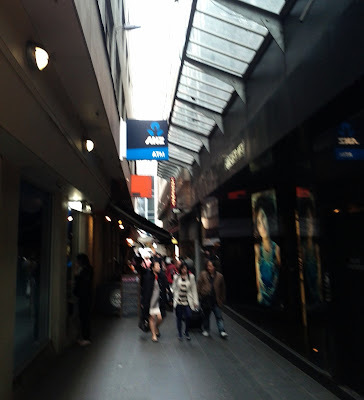 We made our choices waited a couple of minutes, received our stamped boxes and headed up to Bourke Street to find a bench to eat on. 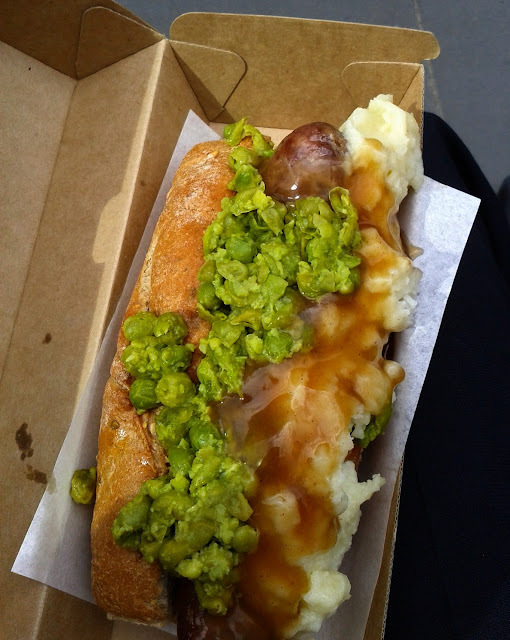 I went for the London ‘Bangers & Mash’ Dog containing a British beef & pork sausage, almost hidden beneath plenty of mashed potato, smashed peas and gravy. The toppings were well prepared if a little difficult to eat without any cutlery! The multigrain roll was fresh and enclosed the sausage which was lean and meaty. I'm not sure if I've ever seen a ot dog like this in England, but the flavours were certainly familiar. 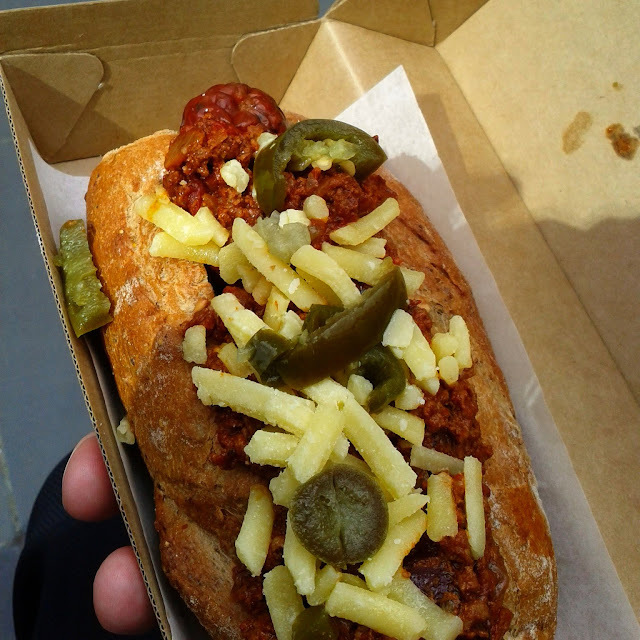 con carne, cheese and jalapenos which he enjoyed. At $8 or $9 a go the well loaded hot dogs are pretty good value, although they didn't fill us up 100%at lunch, maybe we are just a bit greedy. They were some of the best hot dogs I'd seen or tasted, just don't expect a seat!